Vietnam might not a giant country compared to its neighbors like China or Thailand; but if you have just a limited amount of time to explore this S-shaped land, the question about where to go and what to do, especially in North Vietnam might make you feel a headache. Let me help you answer this difficult question Where to go in North Vietnam by this series. First, this article will address the issue where to set foot on. Thanks to the geographical bless, Vietnam has both spectacular mountainous scenes with serene sea views. As a result, the choice of where to go depends totally on your personalities and your demands. Whatever your needs are, North Vietnam surely gives you what you want. Here are some most favorite suggestions of all time. The beauty of this land is undeniable. Its special characteristics are recognized not only nationally but also internationally; as it is voted as one of the 7 current natural wonders of the world. As a result, it can be a real feather in your cap to be visiting this place in 2018. In order to make sure that your trip will be a roaring success, throwing a glance at those recommendations might be worth your while. If you like sporty activities, you can manage time to take kayaking tour. You and your partner can row together to explore this gem of the North. Don’t be afraid to do it by yourself, even if you are not good at swimming. Just make sure to wear a life jacket, and be surrounded by people, do not get too far off places. 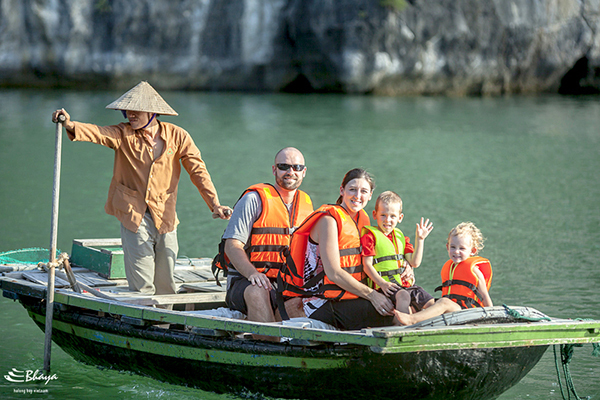 When staying in Halong, remember to choose reliable tour operator because most of your time will be in the middle of the sea. In order to make your plan comes to fruition, it is very important to discuss what you want with them. Our wonderful trip to Halong used to be a narrow squeak just because my memory of goldfish made me totally forget to tell the tour guide that I am allergic to egg white. Thanks to my travel tour guide, who has first aid under his belt; I am still alive and was able to continue my trip. Thirdly, if you arrive this coastal city, it is a great mistake to not eat a fish meatball. My friend said that even when he reached the dizzy heights of Senior Editor, he would not have been as happy as when he tucked in that dish. So you know what your wonderful vacation should include, right? If you are from European countries, the weather in this Northern town of Vietnam might be quite similar to the one in your hometown, with cool breezes in summer and chilly fog in fall. You might even see snow in winter as well. If you do not like that kind of weather, you had better avoid going there between November and February. And if, just if the weather is not by your side in your supposed-to-be-good holiday there, just remember that every dog has its day, so does our vacation. The important thing is to be proactive, and whisper to yourself that “he who laughs last, laughs longest”. Therefore, being optimistic even in the worst situation will guarantee you to have a proud accomplishment. 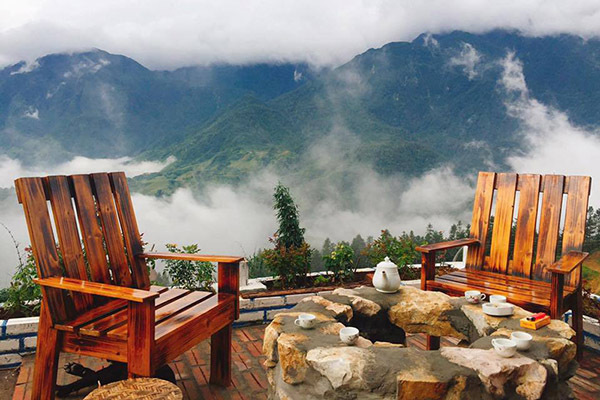 And here are some suggestions to do in Sapa, regardless of the weather. Cuisine in each place tells us a lot about its history and tradition. 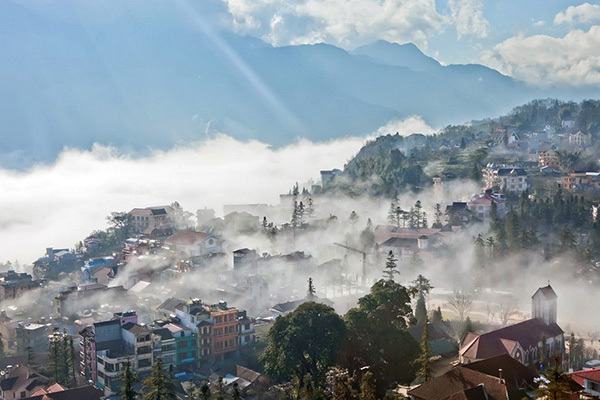 Sapa is not an exception. This town was discovered by the French while they conquered Vietnam. French officials and soldier turned Sapa to become a small French village where they could take a quick break from Hanoi. This town healed they’re homesick as well since the surrounding has borne some resemblance to their hometowns’ landscape with pine tree and rose flower. In fact, the French also built many buildings with the same architecture style in France. Now, some old villas still keep these footprints on their appearances. Because of its mild winter with occasional cold spells, tucking into grilled food here is like a heaven on Earth. Not only your stomach but also your soul can be pampered, and everything suddenly becomes so warm and sweet. Just close your eyes now, imagine that you are sitting shoulder by shoulder with the one you love, enjoying the best-grilled vegetable and meat. You can totally forget about processed food, ready meal or Burger King at home. You are having a balanced diet, which is so delicious that even the fussiest eaters have to stop playing with their food. Actually typing these words even makes my mouth water. So obviously, your wonderful trip to North Vietnam absolutely should include eating grilled food in Sapa. 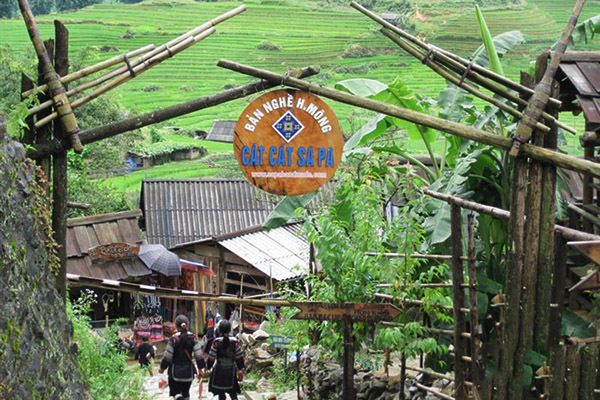 One of the specialties, which makes Sapa one of the best places in the list of “Where to go in North Vietnam” is hill tribe people’s village. You can go hiking for some days, and witness with your own eyes the basic life of people there, no electricity or telephones. They do not have many possessions, but they can probably be the kindest, friendliest people you might meet. There have always been shining smiles on their faces, in spite of how hard life is. Even if you are not able to speak Vietnamese, just smile as it is the most authentic, genuine way of human communications. 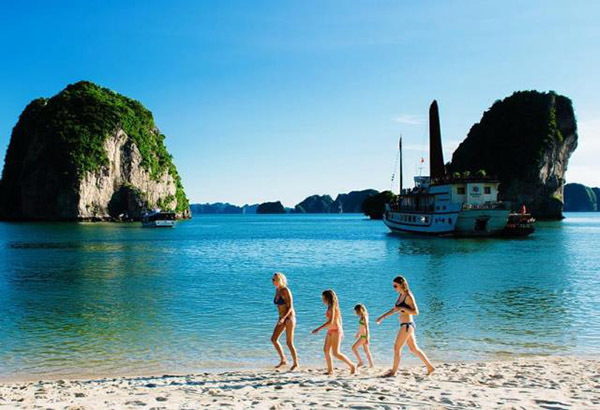 Obviously, seeing them might be a high note of your trip to Vietnam, which might change your outlook on life. In fact, after my holiday spending time with them, having accommodation like them, without the Internet, Facebook, Instagram, Twitter, what’s app; the focus of my life has changed significantly. I do not devote my entire energy and resources to climb the career ladder, but invest my time and my effort in my family, my daughter and the passion of my life. Anyway, the decision lies with you. 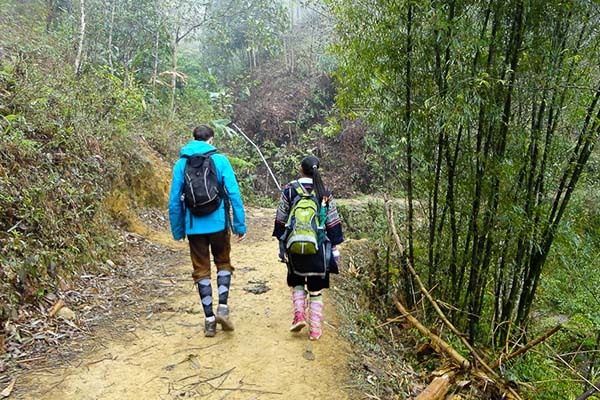 Another way to make the most of your time in Sapa is to stay with local people. There are some homestays there which are designed to match the demand of tourists. Often, they are tastefully designed with full equipment. You can choose to live with the owner or live by yourself. If you live with the host, you can ask them to join their daily activities like going to the local market, cooking with them and learning about local custom and tradition. Spending your vacation that way can deepen your cultural knowledge about that land; as you will have a “hands-on training”, which is exclusively designed for you. The reason is that you are a learner, you are a trainer, you are also an academic staff as well. You choose your favorite aspect and dig into it, by immersing yourself in a lively and vivid real learning environment. You learn by observing, trying and doing. You can know the subtle differences between your culture and the local one. Of course, in order to have a perfect trip in this Northern town this way, you are committed to devoting your time to the trip. You can do more exercise at home as more information needs to be researched. You also might need more than a couple of days to stay there; as 2 days is too short to actually get acquainted with the local life. Anyway, it is just a suggestion. Again, the decision lies with you. I hope that this article gives you some hints about where to go to have an awesome trip to North Vietnam. This land is amazing as there are many things we have not discovered. Again, happy new year and have a great time ahead. And of course, a great trip to anywhere you want in 2018.